As part of their efforts to expand globally and to promote Dubai as an international business hub, H.E. 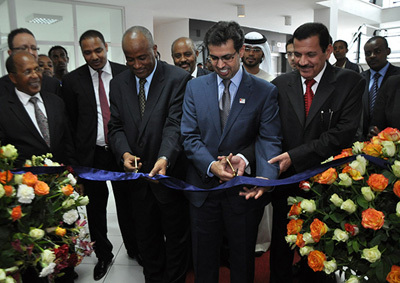 Hamad Buamim, Director General, Dubai Chamber of Commerce and Industry, inaugurated Dubai Chamber’s new representative office in the Ethiopian capital, Addis Ababa on Thursday, May 9. The opening of this first office in Africa is in line with Dubai Chamber’s new strategy of exploring untapped markets of the world, especially under the directives of H.H. Sheikh Mohammed bin Rashid Al Maktoum, UAE Vice-President and Prime Minister and Ruler of Dubai, which emphasise on enhancing bilateral ties with African countries, a strong beginning for which was made during the recently-concluded Africa Global Business Forum 2013 held earlier in the month. The inauguration ceremony was attended by H.E. Yakob Yala, Ethiopian Minister of State for Trade, H.E. Dr. Yousif Al Sabri, UAE Ambassador to Ethiopia, and Amb. Tekleab Aregawi, Head of Dubai Chamber Representative Office in Ethiopia, guests and the media. This new office will open up a gate of opportunities for Dubai businesses and their competitiveness to reach out to the entire African continent while facilitating Ethiopian businesses to use Dubai as an ideal gateway for Ethiopian exports in the GCC and the Middle East region, South East Asia and Europe, said H.E. Buamim. Highlighting the mutual areas of interest, the Director General of Dubai Chamber added that Dubai investors will benefit from investing in Ethiopia’s agriculture, telecom, construction, hospitality and tourism sectors while the Ethiopian businesses will get all the information they would need for entering the Dubai market and the rest of the GCC region through the emirate. It will also lead to a strong two-way trade between Dubai businesses and their Ethiopian counterparts. “Ethiopia is the fifth largest economy in Africa and poised to become the third largest in the next 10 years. The country’s economy is mainly based on agriculture. This sector accounts for about 45% of GDP and 85% of total employment. Ethiopia offers a highly accessible market for UAE businesses seeking expansion into Africa,” said H.E. Buamim. Currently, Dubai Chamber has 269 Ethiopian partnership companies among its members. The emirate’s non-oil trade with Ethiopia reached AED 2.35 billion in 2012. H.E. Buamim stressed on the need to exploring continued joint cooperation efforts between the two sides as he said that Dubai offers a business-friendly environment as well as a stable base with easy access to over 2 billion consumers in the region, he added. The ribbon cutting ceremony was followed by an evening reception at the Lalibela Ballroom of the Sheraton Hotel and was also attended by H.E. Tadesse Haile, Ethiopian State Minister of Industry, H.E. Yakob Yala, Ethiopian Minister of State for Trade, and H.E. Dr. Yousif Al Sabri, UAE Ambassador to Ethiopia. H.E. Yakob Yala stated that the opening of the new office is a good step forward as the UAE and Ethiopia share a strong cultural and trade bond adding that Ethiopia’s trade with Dubai has been steadily increasing due to the strategic locations enjoyed by both the countries. He said that the opening of the new office also reflects the commitments of both the governments in enhancing trade ties as the annual average trade growth rate between them during the period 2004 to 2012 was nearly 58%. H.E. Yala further stated that the trade balance is now in favour of the UAE and the new representative office is the manifestation of the success of the first Africa Global Business Forum held in Dubai earlier this month and will help take the two countries’ bilateral relations to a higher level. On his part, H.E. Dr. Yousif Al Sabri, UAE Ambassador to Ethiopia, said that the new office will play an important role in building bridges of cooperation between the two countries while leading to the enhancement of the UAE’s bilateral ties with African countries. The Ambassador also lauded the efforts of the UAE Ministry of Foreign Affairs and the Ethiopian authorities in facilitating the setting up of the representative office as well as Dubai Chamber’s initiative of reaching out to promising markets of the world, especially with the African continent which he said holds ample investment potential for UAE businesses. Dubai and Ethiopia’s bilateral relationship commenced last May when Dubai Chamber led a 30-member trade delegation to the Ethiopia Business Forum held in Addis Ababa which was attended by 200 participants and culminated with meetings with the Ethiopian Prime Minister and State Minister of Industry. Dubai Chamber has opened its first representative office in Baku, Azerbaijan, last November and the opening of this latest office in Ethiopia will be followed by another one in Erbil, Iraqi Kurdistan, and a series of offices in areas Africa and Asia offering high investment potential for Dubai businesses to explore the investment opportunities in these emerging markets safely and quickly.